Last issue, I presented a glossary of common electric flight terms, but stopped short of any terms related to the battery that powers our planes. This time, I’ll define a few more electronic speed control (ESC) related terms, and then dive into the words describing our planes’ power supply. Without a battery, our electric planes would go nowhere (solar-powered models excepted). It seems that there’s as much to know about the power source as everything else put together. These two words are probably the most commonly misused by e-flight beginners (and by the rest of the world too). Your flashlight does not use batteries. It uses cells. The cells together make up a battery. 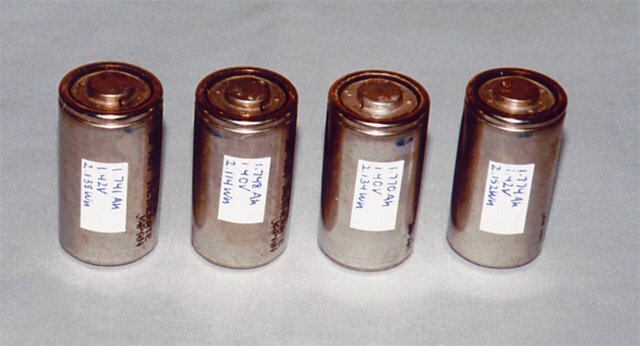 Examples of cells are typical AA, C, and D sized carbon-zinc, alkaline, or nickel-cadmium cells used in radios and other gadgets. 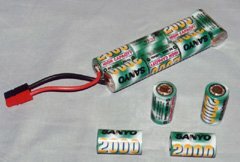 Examples of batteries are 9V transistor radio batteries, and 12V car batteries, both of which are made up of cells. Electric model aircraft are usually powered by batteries made up of seven or more nickel-cadmium or nickel-metal-hydride cells. One such cell produces 1.2V. By comparison, an alkaline cell produces 1.5V, and a lead-acid cell produces 2V. However, alkaline cells cannot provide the high currents e-flight requires, and lead-acid cells are just too heavy. Battery and cells. At the top is a 7-cell battery (or pack) made up of seven Sanyo RC2000 cells. Four loose RC2000 cells are in the foreground. The battery was constructed by soldering two sticks of three cells end-to-end, and then soldering a seventh cell to the ends of the sticks using copper braid as a conductor. The whole pack is then enclosed in heat shrinkable plastic. A variety of batteries. 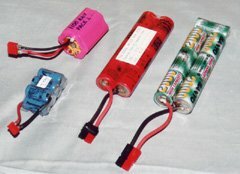 From left to right: a 7-cell pack of Panasonic 300 mAh cells for a Speed 280 pattern plane; a 7-cell pack of Sanyo 1100AAU cells for a Speed 400 sport plane; an 8-cell pack of Sanyo 1000SCR cells for a 2-meter sailplane; and a typical 7-cell pack of Sanyo RC2000 cells for a variety of planes. The most commonly used type of cell in electric flight is still the nickel cadmium cell, often abbreviated to the chemical symbols for nickel and cadmium, "NiCd" (usually pronounced ny-cad). These cells can deliver very high currents, can be recharged hundreds of times, and are fairly light in weight for their capacity. NiMH cells have higher capacity than NiCd cells of the same height and weight, but until recently, could not deliver the currents we need. The new SAFT and Panasonic 3000 cells have now reached the point of usefulness for our application. They have the same advantages as NiCd cells, with the added benefit of being environmentally friendly (the cadmium in NiCd cells is highly toxic, so they must be carefully recycled). The newest electric-flight cell technology, really a specific type of Lithium Ion cell. LiPoly cells have a much higher power to weight ratio, although they cannot deliver the high currents that NiCd cells are capable of (this was true in 2000, but there are now LiPoly cells available that can deliver 40A or more). However, unlike NiCd or NiMH cells, they can be wired in parallel, increasing their current output capability. LiPoly cells have a nominal voltage of 3.7V, as opposed to the 1.2V of a NiCd or NiMH cell. LiPoly cells cannot be charged on a NiCd/NiMH charger. A milliamp is just one one-thousandth of an Amp. The milliamp-hour rating of a cell indicates how many milliamps of current the cell can deliver for one hour. For instance, a 2000mAh cell can deliver 2000mA, or 2A, for one hour. The same cell can also deliver 20A for one tenth of an hour (six minutes). The higher the mAh rating of a cell, the longer it can provide power at a given current. Cells being matched. These are surplus Sanyo 1700SCR cells. I purchased a lot of 50, and cycled each individually until the capacity leveled off. I labeled each one with its capacity in Ah, voltage 15 minutes after charging, and total energy in Wh. I sorted them by capacity and assembled them seven at a time into packs. Note that these cells have no plastic covering. Since the case of the cell is the negative terminal, care must be taken to insulate them from each other. All cells, even of the same type, are not created equal. It is not at all uncommon to see a 10% variation in capacity (in mAh) among the cells in a batch. Matching is simply the process of selecting cells that are very close in capacity, and making those into packs. Because NiCd and NiMH cells have an almost constant voltage until they are nearly dead, one low-capacity cell in a pack will make the entire pack drop in voltage when that cell is dead, while the remainder might still have some capacity left. Unfortunately, the voltage drop might result in insufficient power to remain airborne. By matching the cells, one can build a pack where all the cells last the same amount of time, so when the pack is dead, it’s dead. Capacity of a cell is not everything. One can get, for example, 2000mAh NiCd cells that are much lighter than the RC2000 cells we typically use. However, these have a very high internal resistance. Think of this as a resistor built into each cell. As current flows, a significant amount of voltage is lost in this resistor (remember Ohm’s law: V = IR). This reduces the available voltage, and makes the cell hot (P = I2R), making such cells unsuitable for most e-power applications. A few years ago, German e-flight competitors discovered that if you "zap" a cell with a very brief, very high current pulse, you permanently increase its output voltage by a few percent at any given current level. By doing this to every cell in a pack, the overall output voltage went up by enough to give them an edge in competition without exceeding the maximum battery weight limit imposed by the rules. This procedure is now fairly common for high performance battery packs. Unless you have the right equipment and know what you’re doing, don’t try this yourself. NiCd cells, and to a lesser extent, NiMH cells, have the curious property when being charged that their voltage rises rapidly when the cell is almost charged, and then starts to drop when the cell can’t hold any more. A peak detection charger detects this peak in the voltage, and stops charging at that point. It is this technology that allows us to charge our packs in just 20 minutes without damaging them. By knowing exactly when to stop, we can safely ram the mAh in there at high speed. Some NiCd chargers will reverse the charge current for a very short instant every few seconds (i.e. they will discharge instead of charge during that instant). It is claimed by manufacturers of such chargers that this "burps" the cells, eliminating gas build-up, and thus improves cell life. Whether or not this is true is not widely agreed upon, especially since some manufacturers claim that only their charger does this right, and that doing it wrong is worse than not doing it at all. This is the way NiCd cells in consumer electronics are typically charged. Slow charging is usually done at a current (in mA) equal to one tenth the capacity in mAh, also known as the C/10 rate. For example, the slow charge rate for a 2000mAh RC2000 cell would be 200mA). Theoretically, this will charge a cell in 10 hours, but due to charging inefficiencies, the cell needs to be charged for 14 to 16 hours. Furthermore, at this low charging rate, the cell can tolerate being overcharged for quite a while, so timing is not critical. Trickle charging is even slower than slow charging. This is usually done at a rate of C/50, C/100, or even lower (e.g. 40mA, 20mA, or less for a 2000mAh cell). The idea is to provide just enough charge current to overcome the cell’s self-discharge (the rate at which it loses capacity just sitting there), and a bit extra just to be sure. Just as a cell can tolerate slow overcharging for a while (a few days), it can tolerate trickle overcharging for even longer (months or years). Trickle charging is useful if you want to have a battery that is always ready to use. An alternative to trickle charging is to use a slow charger connected to a timer, so that it charges at the C/10 rate for 30 minutes to an hour per day. If a mismatched battery (e.g. seven cells of 2050mAh capacity and one of only 1950mAh) is allowed to run down too far, the lowest capacity cell will be completely dead before the others. Since current is still flowing, it will appear to the dead cell that it has been connected backwards to a charger. Another way of looking at it is that as the other cells discharge to 0mAh remaining, the already dead cell will discharge below zero (in our example, the 1950mAh cell would discharge to -100mAh by the time the 2050mAh cells reach zero). This is not good for the cell. The best way to prevent cell reversal is to use reasonably well matched cells (for example, don’t mix 1700SCR and RC2000 cells in the same pack), and never run them all the way down. If your plane is equipped with BEC, the cut-off will ensure this never happens. If your plane does not have BEC, just make sure you turn the motor power off before it comes to a stop on its own. Unless you’re flying a sailplane, you typically won’t have enough power to remain airborne long before reaching that point. If a battery of cells is not matched, repeated charging and discharging will result in some cells being at a different percentage of charge than others. The cure for this is to equalize the pack by slow charging it. When the first few cells become full, the remainder will keep charging while the already full cells are overcharged (which doesn’t actually put any more power in; it just heats them slightly). Once all the cells are full, the pack is equalized. By equalizing the battery occasionally, you also reduce the risk of cell reversal. The process of repeatedly charging and discharging a cell or battery is called cycling. There are only a few good reasons to do this. One is to break in a new battery. When NiCd cells are new, or if they’ve been sitting a while, they will not accept a full charge the first few times. Each time you charge them, they’ll have a slightly higher capacity. After about four or five cycles, this will level off at about the rated capacity of the cell. Note that NiMH cells appear not to need such a break-in; they have their full capacity the first time you charge them. Even with NiCds, there’s no requirement to formally break them in; you can just go fly, with slightly shorter flights the first few times. Another reason to cycle a cell or battery is to measure its capacity. By fully charging, and then discharging at a constant current until the voltage drops to about 1V per cell, you can determine the capacity (which is the discharge current in mA, times the time in minutes, divided by 60). Great GREAT GREAT website!!! There were many questions that I have answers to!!! Here is another that was not covered. Where can I find a simple, schematic of everything an electric plane needs to fly? Connections, battery, speed controller etc. Mike, take a look at my article Electric Flight Wiring for details on how to wire an electric plane.